For a long time, I thought growth hacking was just an overused buzzword that would soon disappear into obscurity. That was before I joined the popular GrowthHackers community where I was exposed to various growth hacking techniques through insightful articles, case studies, and AMAs with marketing thought leaders who were thriving because of growth hacker marketing. That was when I discovered the true meaning of growth hacking – marketing techniques used by startups/small businesses/solopreneurs to grow their respective businesses in the absence of big budgets. These marketing techniques are often metric and ROI driven, rather than chasing vague notions like branding or mind share. In the past few years, top companies like Netflix, Dropbox, and Airbnb, among others have used growth hacker marketing techniques to acquire new customers and achieve sustainable growth. Ryan Holiday’s book Growth Hacker Marketing aims to be the essential growth hacking guide for growing a sustainable business. It’s a quick read – in fact, it’s like reading a long form blog post on growth hacking which was one of the issues I had with the book (more on that below). In less than 80 pages, Ryan explains the steps involved in growth hacker marketing, elaborating each step with various examples of companies which leveraged growth hacking to scale up their respective businesses. Sadly, it just doesn’t have enough content to be considered a serious growth hacking guide. Ryan features several examples of companies that used growth hacking as a secret weapon to acquire new users to their platform. I really enjoyed reading about how Airbnb started as a concept and how Hotmail used a simple growth hack to gain millions of new users. I was also intrigued by how Ryan used growth hacking to boost sales of Tim Ferriss’ book The 4-Hour Chef. The concept of Product Market Fit (PMF) is explained well. Product Market Fit is achieving a state in which a product and its customers are in perfect sync. As Ryan calls it, this is the ‘holy grail for every growth hacker’ and he does a good job simplifying this technical concept. 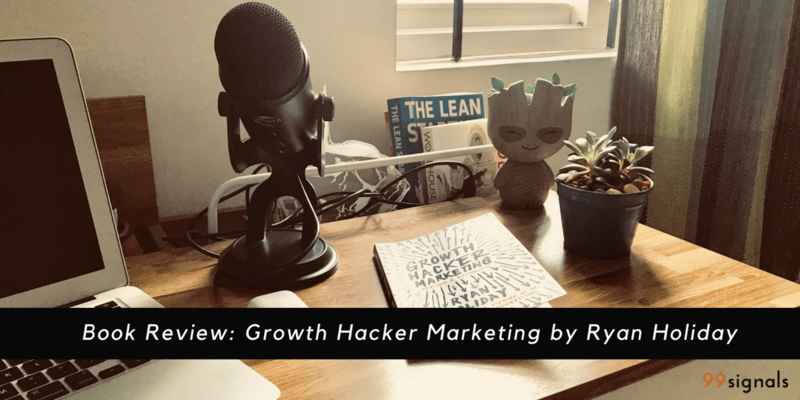 The revised and expanded edition of the book contains an additional chapter where Ryan explains how he used the four-step growth hacker marketing approach to promote his own book. So these are the things I liked about the book. Now let’s talk about a few things that I didn’t like. The length: As I described earlier, this book reads like a long form blog post. It just doesn’t have enough content to teach you anything life-changing. If you’re already aware of the growth hacking concept and are familiar with the works of Andrew Chen, Noah Kagan, and Tim Ferriss, you’ll not learn anything new in this book. The examples: Yes, there are several examples of brands which became household names after adopting growth marketing techniques. But these examples are just that: examples. They are not case studies. Ryan provides little to no data for his examples. For instance, he talks about Twitter’s nifty little growth hacking technique where a growth hacker named Andy Johns replaced Twitter’s antiquated email system with automated reminders, alerts, and notifications that have since increased engagement. But there’s no data provided on how this move improved engagement and user retention for Twitter. In fact, Twitter is still struggling with user growth. The price point: A minor gripe, but nonetheless I found the price of this book to be marginally high. I bought the paperback edition of the book on Amazon and paid ₹162 (approx. $2.50). And this was bought on Prime Day (Amazon’s big day of deals and discounts) at a discounted rate of over 30%. The revised and updated version of the book doesn’t add much and brings nothing new to the table. There is an additional chapter on how Ryan Holiday used growth hacking techniques to promote his book and an FAQs section at the end which are mostly answers to questions Ryan received when he participated in a Reddit AMA. Growth Hacker Marketing is an interesting read, but it falls short of expectations. If you’d like to learn more about how to leverage growth hacking to grow your business or website, join the GrowthHacker online community instead and read some of the trending articles and case studies on the forum. But if you have to purchase a copy of the book, grab the Kindle edition and save yourself some money. Just don’t expect it to be a tutorial on growth hacking. Growth Hacker Marketing is an interesting read, but it falls short of expectations. If you'd like to learn more about how to leverage growth hacking to grow your business or website, join the GrowthHacker online community instead and read some of the trending articles and case studies on the forum. But if you have to purchase a copy of the book, grab the Kindle edition and save yourself some money. Just don't expect it to be a tutorial on growth hacking.